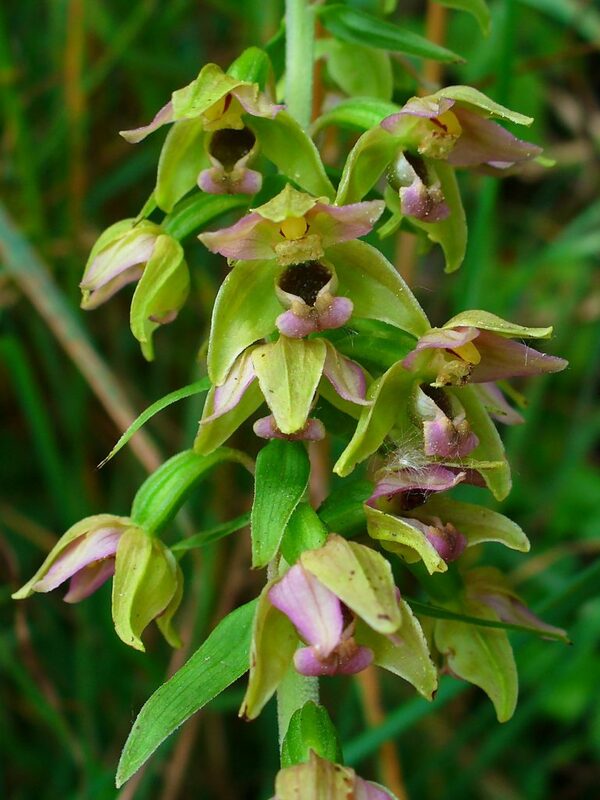 Epipactis helleborine is a perennial monocotyledon herb 25-80 cm, from a short rhizome, roots very thick, associated with orchid type endomycorrhizae (Brundrett and Kendrick 1988). 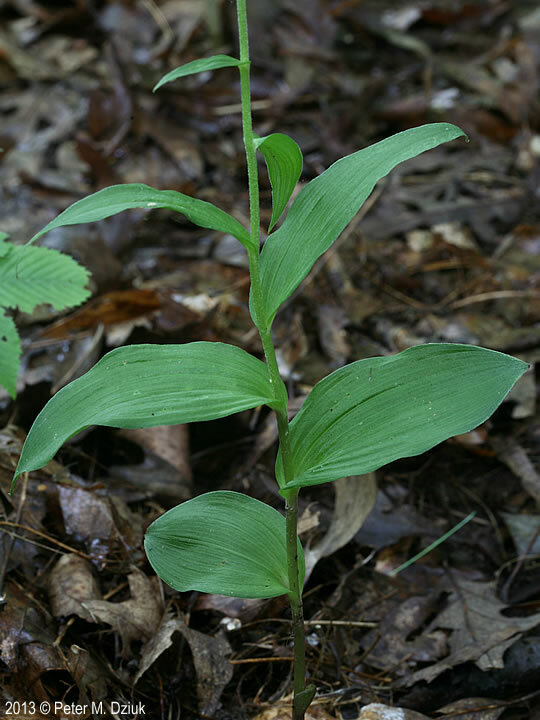 Epipactis helleborine leaves an stem. 2013 © Peter M. Dziuk. Minnesota Wildflowers. minnesotawildflowers.info (Accessed 5/2018). Leaves stalkless, 4-18 cm long, 1.5-8.5 cm wide (Flora of N. America 1993+), smaller upward, base clasping, stem, blade egg-shaped, veins deeply impressed, becoming small, narrow bracts in inflorescence. 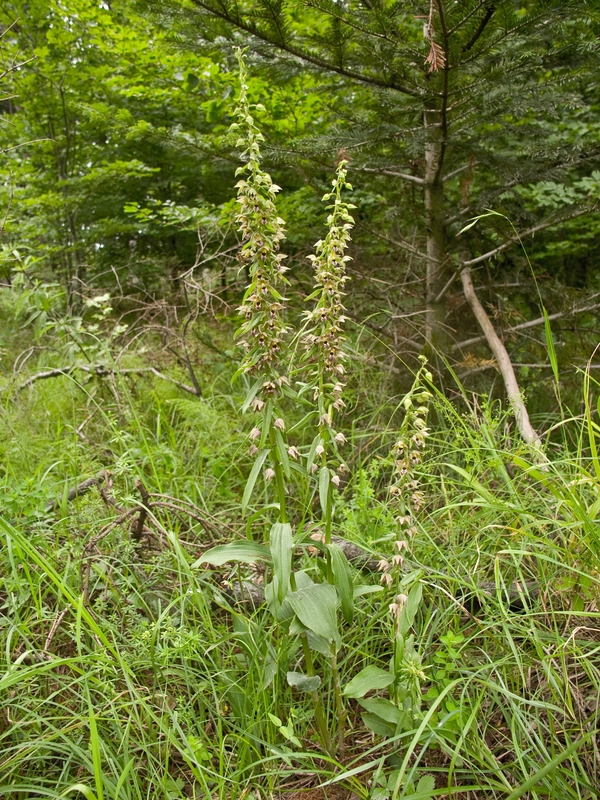 Epipactis helleborine commons.wikimedia.org (Accessed 8/2016). Flowers purplish green, bilaterally symmetrical, nodding, orchid-shaped, sepals and lateral petals lance-shaped 0.8-1.4 cm long, sepals slightly larger than petals, tips pointed, dull green with purple veins, lower petal (lip) cup-like, interior deep red, greenish-purple, ovary inferior; inflorescence with many flowers, each above a narrow, leaf-like bract 0.1-0.7 cm long, in an unbranched, spike-like cluster 10-30 cm long at top of stem; blooms July-Sept.
Epipactis helleborine fruit close-up. By James Lindsey. Copyright © 2018 James Lindsey. Ecology of Commanster. www.commanster.eu (Accessed 5/2018). 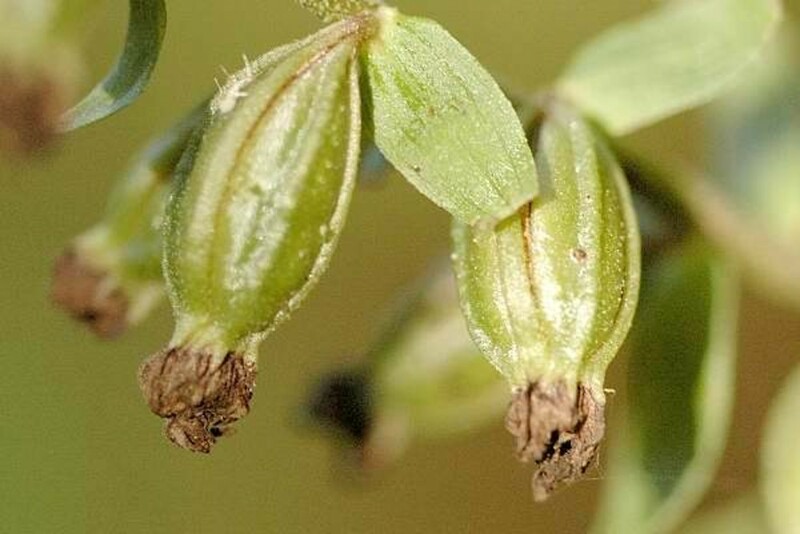 Fruit dry, an elliptic, deeply ridged capsule. Habitat: Disturbed woods. Shade tolerant. Notes: Originally planted as a medicinal. Now widely escaped. Naturalized since 1879 (Flora of N. America 1993+).